We have a ritual we call Fun Family Friday. Every Friday, we make dinner, have a special dessert, and we eat off our lap as we watch a movie. One Friday, I decided to google quick healthy chocolate fudge. Searching I found this recipe for Sugar Free Chocolate Fudge by Chocolate Covered Katie. I left it too late to make and didn’t have time to freeze it, so we ate it as a soft serve dessert. It was delicious – like the sort of delicious you just want to bury your face in. I wondered what I could do to make this something that was suitable as a lunchbox snack. 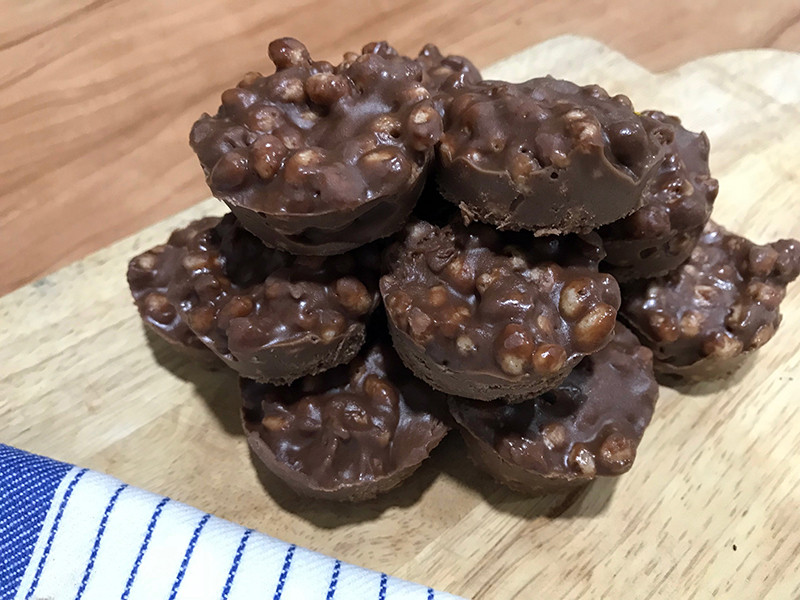 These Chocolate Banana Rice Bubble Wheels are adapted from Chocolate Covered Katie’s recipe and are the outcome of trialling and testing. What I love about this mixture is that you can eat it whilst it’s soft (before you put it in the freezer) and it’s the bomb. They are awesome straight out of the freezer and they are a bit squishier and more fudge like when they’ve been in the lunchbox. Make the mix, and test all three ways. Let me know what’s your favourite way. Store in a single layer in an air-tight container. Hi Bel, love your work! Is there a substitute for Cacao butter please? Hi Nicole, apologies for the delay. Mmm, not really if you want them to hold shape in the lunchbox. If you didn’t want to put them in the lunchbox, you could replace it with coconut oil or boost up the amount of coconut butter. However, just a reminder that because coconut oil becomes liquid in heat, you can expect these to become very squashy if using coconut oil.